The RetailVision is the premier global event for the retail channel. 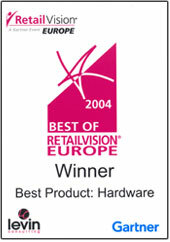 “The Best of RetailVision Awards”™ honours excellence in innovation, channel strategy, and presentation for products. The awards are selected by the Top 100-Level Retailers who attend RetailVision and buy €60 billion worth of products each year. “Unibrain values this award as a very important recognition of several years of efforts and research perfecting iZak ™. Furthermore it confirms our vision that iZak™ is a revolutionary product that will change forever the way we watch movies” said George Zachopoulos, CTO of Unibrain. For the past 15 years, “The Best of RetailVision Awards”™, produced by Vision Events®, a Gartner, Inc. company, have been acknowledged as the consumer electronics retail channel’s leading honours. The award winners were voted on by retail buying executives attending RetailVision to see the latest in new technology while evaluating potential partnership opportunities at the event’s Private Boardroom Appointments. The invitation-only boardroom meetings are a vital part of the decision-making process that retail buyers undertake in order to stock shelf space. About Unibrain: Unibrain is a global leader in the development of FireWire (IEEE-1394) hardware and software solutions, and offers a complete line of FireWire computer and consumer products for a wide range of applications. Unibrain has been an active member of the 1394 Trade Association since 1997 and continues to play a vital role in the advancement of FireWire technology. About Gartner : Gartner, Inc. (NYSE: IT and ITB) is the leading provider of research and analysis on the global information technology industry. Gartner serves more than 10,000 clients, including chief information officers and other senior IT executives in corporations and government agencies, as well as technology companies and the investment community. The Company focuses on delivering objective, in-depth analysis and actionable advice to enable clients to make more informed business and technology decisions. The Company’s businesses consist of Gartner Intelligence, research and events for IT professionals; Gartner Executive Programs, membership programs and peer networking services; and Gartner Consulting, customized engagements with a specific emphasis on outsourcing and IT management. Founded in 1979, Gartner is headquartered in Stamford, Connecticut, and has more than 3,700 associates, including approximately 1,000 research analysts and consultants, in more than 75 locations worldwide. For more information, visit www.gartner.com.